This is a topic that has weighed heavily on my mind the last few weeks, and after some consideration I have decided to publicly share my thoughts on this topic. My personal perspective on this is somewhat unique. I am the oldest of 11 (yes, eleven) children. 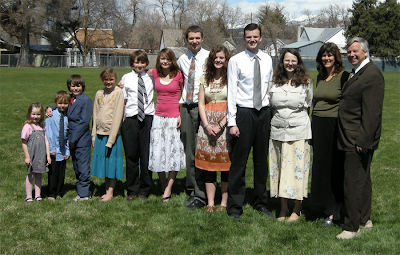 Growing up, I have always looked up to and admired the mothers of large families. My own mother, of course, is especially one of the women that I admire. There is something about having a family that large that makes a woman, well, become. A mother becomes more when she has this responsibility. More patient. More loving. More skilled. More diplomatic. More refined. More intelligent. More full of Charity. Even more Christlike. I look up to these women, and I do not think it a selfish thing to want that experience of becoming for myself. I really feel a need to write a defensive post, largely because having a large family is becoming increasingly unpopular, even here in Utah. Disclaimer done. Picture the scene: A young woman announces to her friends that she is going to have a baby. Squeals of delight fill the room. Baby showers, gifts, and baby-mooning soon follow. Two become three, and their world will never be the same again. Later the young woman becomes pregnant again. Again there are well-wishers, and general excitement over the new baby's arrival. Again, a beautiful scene. Here comes my baby #3. I am pleased to say that my community really reached out to me when my 3rd was born. Meals were brought, and family traveled to see our little guy and support him. Overall, it was all very charming. But already things are starting to change. When I go out with my children, my baby doesn't always get the adoring looks my first son was privy too. And I'm just starting my family. What happens to a family when baby number 8, or 10, or 14 comes along? Neighbors will still bring food, family will still offer their support, but society offers only condolences. "They're crazy!" "The poor children!" Why is having a large family frowned on? Why is it uncool for a young girl, when asked what she wants to be when she grows up, to respond, "A mother"? I agree! We just had our fifth child this May. Where with our first we had showers and hearty congratulations. With this fifth child we got nary so much as an "aww". Even my husbands closest brother didn't come to see the child till she was almost 3 weeks old. The only gift came from my mother. My MIL (a child herself in a family of six and with 5 children of her own) has hardly acknowledged the new one. I get plenty of looks when we're out and can sometimes feel the disapproval of people in the stores drilling holes in my back. Its such a pity our society has been conditioned (by feminists I believe) that children are a hindrance and a nuisance.I'm sure they appreciate the fact that THEY were born and loved growing up. I think this is great. I come from a family on 6. I myself may not have that many, but who knows. I am a mom to 4 young daughters and I feel that others judge me for having a "large family". I always here comments like "you have your hands full" and disapproving looks and stares. I am so happy to have been blessed by God with this amazing family and I couldn't imagine lift without them. Not too long ago 4 kids didn't seem like such a big family. I come from a blended step family of 4 kids and I have so many fond memories of playing with my siblings. Thank you for writing this post.